As you know, my collection of copper cookie cutters, specifically those hand-crafted by Michael Bonne for Martha Stewart and sold through her now defunct Martha by Mail catalog business, has been featured quite a bit here and on my Facebook Page. 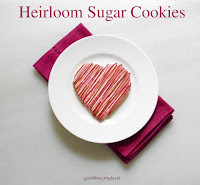 The fact that I cherish my collection and enjoy using them to create little individual works of cookie-art to share with you, comes as no surprise, I’m sure. However, what may surprise you is that over the past few months I have had the pleasure of getting to know and work with Michael Bonne and his wife and partner in business, Teresa. American artist, Michael Bonne, has earned the title "world-renowned coppersmith" because his work is exceptionally unique and authentically American. During their early years as antique collectors and dealers in Indiana, the Bonne’s developed an appreciation for cookie cutters from a bygone era. Rustic and primitive cutters especially, captured Teresa’s attention because of their simplicity and charm. Disenchanted by contemporary designs and the rising prices of 19th century examples, Teresa asked Michael to make a few copper cutters for her kitchen. That was the “Aha!” moment for Michael as he recognized the value in creating cutters fashioned from copper, combining both the time-honored tradition of American craftsmanship and the Bonne’s own unique design concepts. 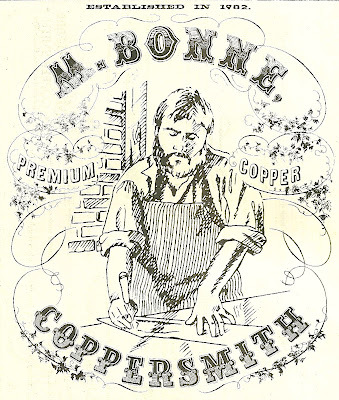 So, Michael Bonne Coppersmith was launched in 1982, eventually and forever transforming the world of cookie cutters and garnering a strong following of loyal fans. As his passion and customer base grew, so did Michael’s creativity and expertise. 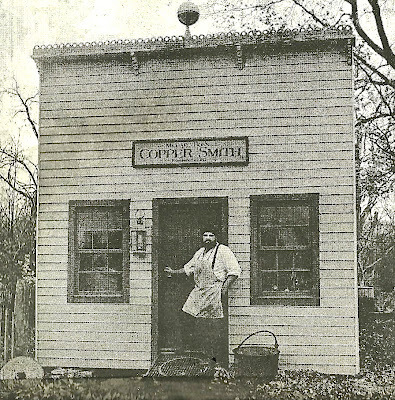 A landmark event for Michael and Teresa was the 1988 acquisition of Cape Cod Copper Works, which ironically was the source of the copper trays and serving pieces used by Martha Stewart during her early years as a caterer in Westport, Connecticut. This development gave Michael Bonne Coppersmith another more contemporary copper line to complement what until then, had been mainly a vintage nineteenth century look. 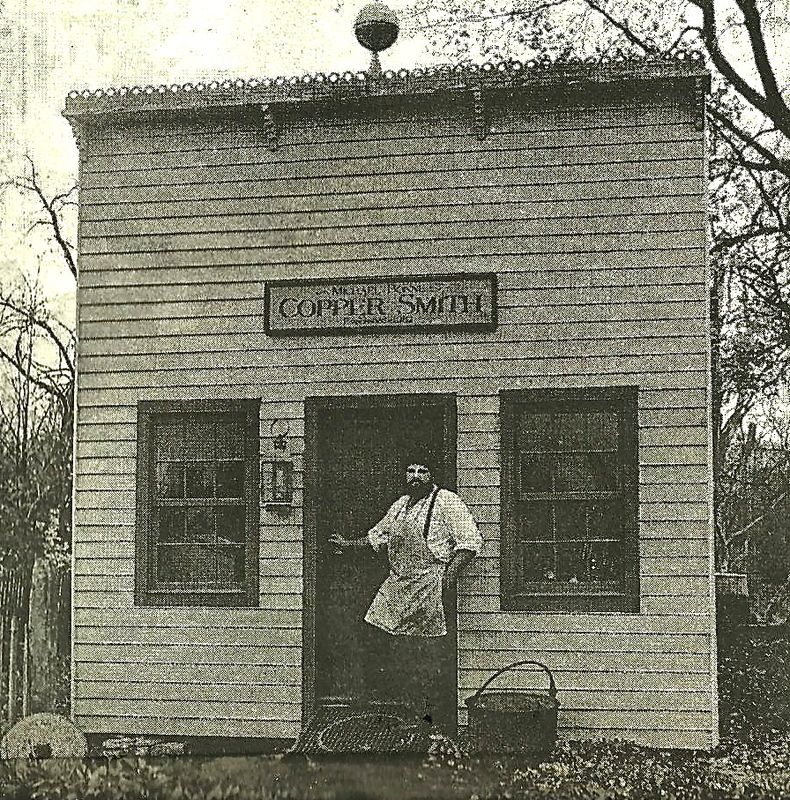 Little could anyone guess at the time, but it would eventually introduce this humble coppersmith from Indiana to America’s best-loved lifestyle expert. In the summer of 1996, Martha Stewart’s business empire expanded to include a mail-order business in her magazine that would later develop into Martha by Mail. After a strong response to some Cape Cod cutters from her home that had been featured in an article of Martha Stewart Living, Martha took note. Very much wanting to feature copper cookie cutters in her mail-order line-up, she directed her creative team with locating a coppersmith in the tradition of Cape Cod Copper Works. To Martha's delight, she found that Michael and Teresa had acquired Cape Cod Copper Works and were producing copper cookie cutters too! It was a match made in heaven and later that fall the very first edition of Martha by Mail copper cookie cutters was born! Several thousand sets of Star & Moon were delivered to customers just in time for Christmas. When demand exceeded supply, Michael Bonne and his team of elves literally worked around the clock with Martha footing the bill for overnight shipping to fulfill every order so that no one would be disappointed on Christmas morning. 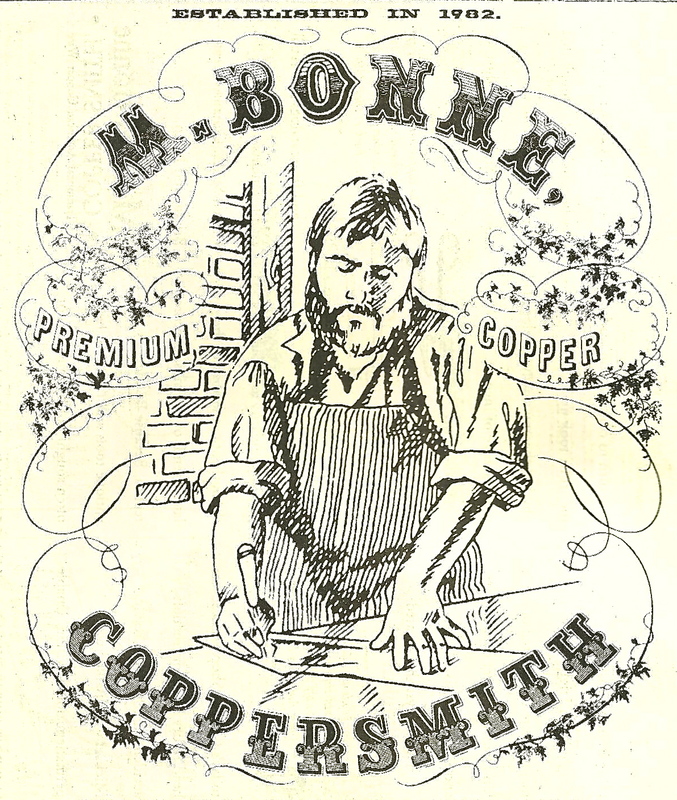 Following this initial success, collaboration between the Michael Bonne Coppersmith Shop and Martha by Mail continued, ultimately producing numerous innovative copper cookie cutter designs that enchanted the masses, which continue to remain highly collectible nearly two decades later. Before the sad demise of Martha by Mail, the Michael Bonne Coppersmith Shop also made exclusive cookie cutters for other American companies such as Williams-Sonoma, Eddie Bauer, The Walt Disney Company and institutions like The Smithsonian and The Museum of American Folk Art. Michael has even produced pieces for The White House! Although I had already amassed a large collection of Michael’s copper cookie cutters from the Martha by Mail line, I wondered about those who hadn’t. This is precisely what my friend Janet and many other readers kept asking me as my blog began to incorporate Michael’s oeuvre. We both felt Michael’s exit had created a void for those that missed out on collecting his work while it was still available and who still longed for new Michael Bonne cookie cutters. So Janet and I set out to find Michael Bonne and begin a dialogue with him. If you follow her blog, you may have noticed this post after Janet located the Bonne’s and Teresa parted with her personal Martha by Mail cat cutters in memory of Janet’s cat, Bing. Janet and I were eager to encourage the husband & wife duo to begin creating new copper cookie cutters for a whole new generation of Michael Bonne fans. As evidence of the current demand for his craft, we pointed to auction sites such as e-Bay where Michael’s vintage cutters continue to command astronomical prices and captivate collectors all over the world. Sadly, the most coveted of Michael's Martha by Mail cutters remain financially out of reach for most longing to create cookies with them and that’s why we needed Michael Bonne back! Janet and I have followed with extreme interest the Michael Bonne cookie cutter market and are constantly astounded by some of the prices his cutters end up selling for. However, what isn’t surprising is why collectors want to gather and cherish these copper cookie cutters from Michael and Teresa’s “Coppersmith” days. 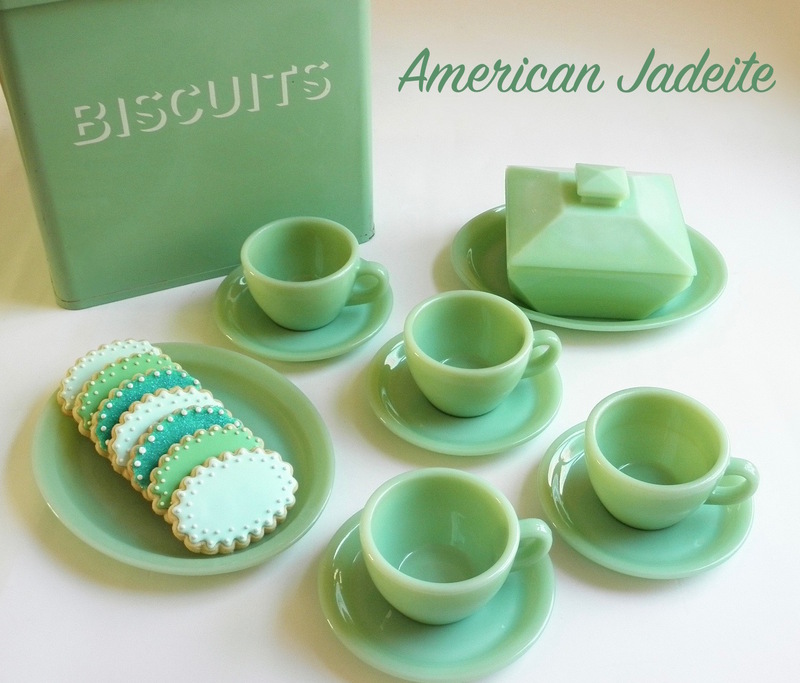 They are truly iconic American treasures meant to be used and passed down for the next generation to enjoy. This brings me to something I'm very excited to share with you today. Yes, the world of collectors and bakers are in for an exciting treat and, it begins now! Janet and I are delighted that Michael has agreed to return to creating copper works of art that are both functional and beautiful for use in our homes! We couldn’t be happier to bring this piece of news to all of you, because as you are well aware, we have been fans and collectors of Michael's work for more than two decades. It also delights us to announce that every one of you will once again have the opportunity to create new traditions in your own home using a brand new era of Michael Bonne cookie cutter collectibles! Working from their Florida studio, the Bonne’s are introducing new and exciting designs as well as cutters that pay homage to vintage designs. This new generation of copper cutters will become instant heirlooms and have everyone baking artful and delectable cookies to share with family and friends. With an Etsy Store and a Facebook Fan Page now in place, Michael is showcasing his new work that is available for purchase today. You'll want to keep checking back because Michael and Teresa launch new designs every few days! Furthermore, Michael also accepts requests from his fans to create one-of-a-kind pieces. Perhaps you have your child’s artwork that you wish to preserve forever in the form of a cookie cutter or sculpture. Michael can do it for you! You may contact Michael directly through Teresa, who not only does a lot of creative design work, but also manages the business side and keeps up their new Facebook page and Etsy store. The Bonne’s love to hear from collectors and their fans. Feel free to send them a message to welcome Michael back and to, of course, let him know which copper cookie cutters you want! I also invite you to stay tuned to my blog and to Janet's blog for some exciting news about copper cookie cutters that Michael Bonne has created from our own personal designs which will soon be available exclusively through our blogs. We hope you'll join us in welcoming Michael Bonne back and making his unique works of copper a part of our homes. NO WAY. I'm flabbergasted! This is amazing news! I'm definitely going to get some of these this time around!! Isn't it wonderful Nick?? I can't wait to have cutters available for everyone! Thanx david..Been waiting for this..Now i need to Get some!Your the Best.. There is no one else I'd rather go on this journey with, David! Thanks Darlene! Janet, I couldn't agree more. You and I are going to make sweet things! 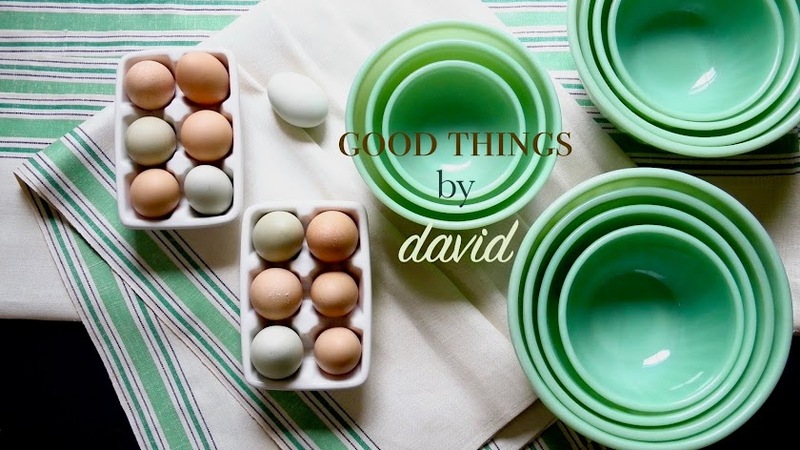 Oh David, this is WONDERFUL! I'm so interested in seeing what you have lined up. Can you PLEASE give us any hints? I am definitely going to start collecting these. Phoebe, I can't tell you exactly what we have lined up, but in the near future the first set of cookie cutters will be available for purchase. How nice! That must be exciting to have those drawings of his. Treasure them! David, the next time you speak to Mikey, ask him about Ruth Jones...that's me. also, ask him if he's heard from the elusive Allen Wheatley. I will send him a message about you, Ruth!